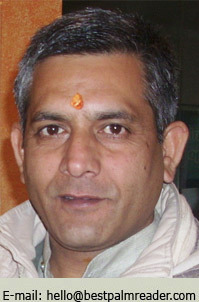 I am the oldest son to the Royal family of Sunlineage of Shrangirampur Of Uttar Pradesh in India. I was trained and worked as a journalist. During one of my assignements, I was fortunate to have met the great Guru Hanumantanandji. He was a great predictor. He simply looked at me and without knowing me started to make predictions about my life, both past and future. His reading and accurate insight about my life surprised and amazed me. This encounter stirred a deep desire in me to learn more about this subject and techniques. 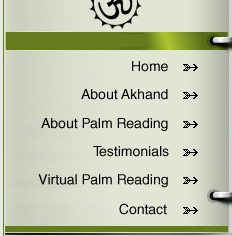 After years of research, I came to the understanding of how complete and precise palmistry is. Additionally, I was very fortunate to meet one of the most famous fortune teller, Dev Guru Umamaheshwarji. He used many ancient techiques to make predictions through Palmistry, Astrology, Numerology, Card reading, Face reading, Graphology, and Lipi reading. After many challenging trials and tribulations, at last Dev Guru Umamaheshwarji agrees to become my teacher (Guru). During my studies, I realised that Palmistry and Astrology are part of a very unique and precise ocean of ancient science. They are part of the Vedic culture and knowledge passed from generations to generations. I have received initiation and blessing from the great Guru Ramsurchdasji, at which point he transfered his knowledge and energy to me. This was a euphoric and unexplainable experience. I then started to practice that which our ancestors have preserved and passed on to us. My main goal is to preserve and protect this precious jewel of ancient science. After becaming a pratictioner and custodian of this knowledge, I have had the honour to help and guide people of all backgrounds from all around the world in more than 60 countries. I have met many clients who didn't speak a word of English or Hindi, but language has never been an issue in order to communicate messages of the soul. In 2008, I was encouraged by and received help from some of my wonderful clients to start this website(they came up with this domain name), in the hope that it will extend my services to many more people than just those visiting Udaipur, India.